Chris Hutchinson (left) on the ball for County Armagh in the 5-1 victory over County Tyrone. Pic by PressEye Ltd.
Alberto Balde’s second-half hat-trick helped County Armagh see off County Tyrone for Junior Section success despite trailing to an early own goal. Chris Hutchinson found the net from the penalty spot in the closing stages of the first half to level the match. County Armagh grabbed control after the break - with Balde setting the standard thanks to his power and pace. Tyler Marsden’s long-range strike helped to increase the Orchard County advantage. 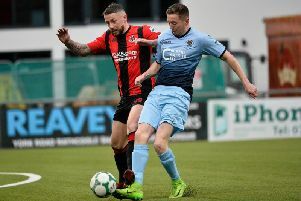 “We started off well but then fell behind to an own goal,” said County Armagh coach Dean McCullough. “That rocked us a bit and County Tyrone hit the post plus had a goal disallowed in that period after 1-0. “We got a penalty late on in the first half, which helped before the break. COUNTY ARMAGH JUNIOR: Adam McAlpine (Glenavon), Patrick Kerr (Armagh City), Jack Adamson (Portadown Youth), Lee Upton (Portadown Youth), Daniel Neill (Portadown Youth), Harry Evans (Portadown Youth), Chris Hutchinson (Portadown Youth), Tyler Marsden (Portadown Youth), Rioghan Crawford (Lurgan Celtic), Alberto Balde (Portadown Youth), Tom Barratt (Portadown Youth). SUBS (used): Jack McIvor (Glenavon), Daniel Gordon (Portadown Youth), Scott McCann (Loughgall Youth).